Amazing renovation by Steven Kent A.I.A. of Val Powelson's 1960 "Sunbow House." 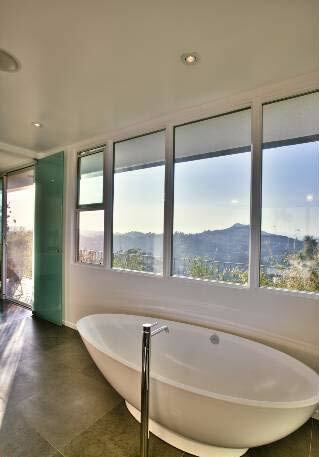 Unsurpassed views of LA, Valley & Canyon, direct access to park at end of cul de sac street. Extensive open floorplan remodel updates mid-century design with unique Butterfly roof line for today's lifestyle. Newer pool, spa, sound and security systems, cook's kitchen, baths with Caesar stone, carrera marble, commercial-grade maple/basalt floors, Agape fixtures, landscaping. Exquisite in every detail. A pleasure to show.